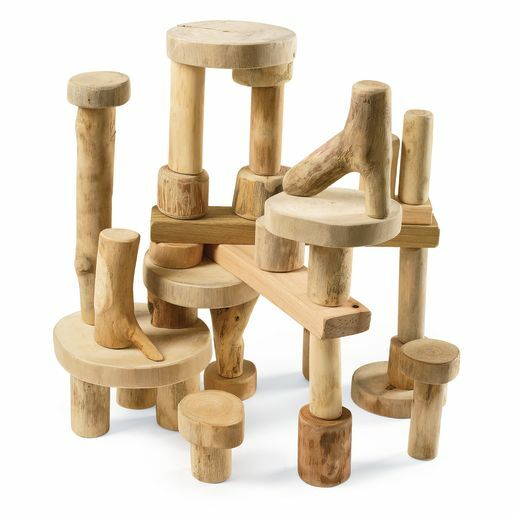 Children will be inspired to be creative and build with these distinctive Tree Blocks. Tree Blocks are made directly from reclaimed tree branches - no live trees were used to make Tree Blocks, only surplus treetops and abandoned fruit tree braches. After the wooden shapes are cut, they are carefully smoothed and sanded for safety. Each piece is precisely cut in five heights: 3/4", 1-1/2", 2-1/4", 3", and 4"
Pieces range in diameter from 1" to 5-1/2" and in height from 4" to 10"